Synopsis of second half at DigiSights 2013 about the evolution of healthcare industry with the digital and social media world. Following an exciting first half at #DigiSights13, India’s first digital marketing conference in Pharma and Healthcare organized by MediaMedic, the post lunch session started with a heavy lunch and some amazing thoughts from Andrew Spong, Managing Director, STweM Ltd. who focussed on the challenges the world health market is facing now. However, he feels that regulations are not the way ahead but educating the market to entice participation. He also added that attitude needs to change if digital has to succeed in the health market which has been a one way communication market from its inception. The event also showcased some amazing videos and case studies on how the healthcare market is using digital and trying to create engagement with customers globally. After some video talks, presentations about global scenario, it was time to focus on the Indian market and the conversion got involved into 4 small back to back sessions covering the influence of social, mobile and tech. Opportunities In India : The session started with Salil Kallianpur, Commercial Head – Centre of Excellence, GlaxoSmithKline who cheer leaded a set of discussions by focusing on how digital can fill up the gaps in the health industry. He stressed on how to manage the huge data; industry should jump in as doctors don’t have time. Digital has provided a medium to make business simple. However, the customer is choosy today which makes the market competitive. But then it gives the flexibility to the business to serve the customer better. 2. Pharma being a regulatory world. 3. No clear idea on what to do on digital. Besides he also asked the industry to think on online reputation and how to engage with customers in a medium that is so open and throws multiple challenges. Building Communication network with Digital: Dr. Salil Shinde, Senior Manager, Pfizer India was next to take the stage with a session focused on digital communication. The basic idea was that people come and engage with companies but then the industry will have to be honest and ready to solve problems. Going further he focused on how social channels and apps should be built. The idea should provide the customer value in a fun way. Giving examples on how it is being done, Salil added that the Govt of India is doing substantial work and it is the job of the industry to support the initiatives. Gamification and mHealth: Prateek Gupte, Application Specialist, MediaMedic Communications Pvt. Ltd. after briefing the audience about gamification, explained how you can take actions while you are in a game. In other words, the user plays a game and is rewarded for his actions. The idea is to encourage the user to play more with badges, leader boards, etc. Prateek further shared some ideas on how gamification can be inculcated in the healthcare space to make it more engaging. After some heavy post lunch sessions, it was the right time to grab a cup of coffee/tea with some much required mingling around with the participants. To share thoughts on the subject, you need a marketer who started his journey as a salesman. 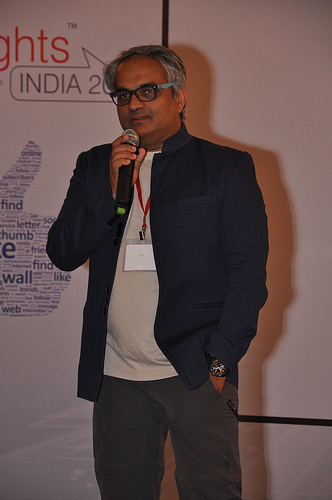 Mahesh Murthy, Founder, Pinstorm was the clear choice for the day’s most awaited talk. He started his simple and powerful talk minus presentation by telling the audience how the marketing world has changed. The days of Philip Kotler and 4P’s of marketing don’t matter too much. Today brands that spend less money in ads are growing into bigger brands and vice versa. To share more on the thought, he cited today’s bigger brands – Facebook, Google, WhatsApp, etc. that rarely advertise about their company unlike the traditional brands. Still they are the bigger brands today. So the next question was how is it happening? The shift has happened due to word of mouth and digital that is powering word of mouth. He further highlighted that today it is about consumers first and then comes the product. The reason being the consumer is empowered with digital. The same is true in the pharma world and the doctor is no more god. Doctors are being evaluated by consumers today and they are making choices. So it is imperative for doctors to adopt this medium and listen while marketing forces of pharma companies can improve sales force by going digital. 3. Analyse them – what are people worried about. 5. It is a round-the-clock work, experiment too. With that it was time to wind up the one day workshop. The floor was open for networking and one to one interactions.